That was one of the questions I’ve been waiting all my life. The setting was perfect, too: late afternoon when the sun was about to set on the beach. The wind blew my hair away from my face. The sound of the waves was the natural back sound, enough to mess with the rhythm of my beating heart. He was a really nice person I’ve known since I was little. Stabile job, more than enough income, work hours that would still enable us to have a nice conversation together after a long day—all were perfect to secure a nice simple life full of romance. Good looks, caring and considerate attitude, tender loving—all were perfect to make someone feel wanted and loved each and every day. What more does a woman have to ask for? But, still, something was missing. Love. Not his, but mine. He was not the person I was in love with all this time. That was the one that’s missing. The person I loved was someone who would not love me—at least, not in the way that I love the person. The person I loved wouldn’t care about the perfect timing, the perfect place, or the perfect words. But, I was swayed by all your imperfections anyway. Yes. Yours. I was a fool who threw away the world that was offered to me on a silver plate just to chase a nonexistent future. The second time I heard those words was at the theater, right after our practice ended. Everyone was getting ready to change and go home. I was sitting on the edge of the stage, knowing that the dressing room would still be packed with other members who wanted to finish everything and called it a day as soon as possible. But, I was still there, deep in my thoughts. Because, you were also there, sitting right next to me. The setting was nowhere near perfect, far from what I’ve been dreaming of since my time in kindergarten. The time was even worse since we both were exhausted after hours of practice. I was literally drenched with sweat and I let it all out, running on my skin, dropping down to the floor. But still, my heart beats were crazier than they ever be. Deafening rhythm went faster and faster with every tick of the seconds. And I know it wasn’t the residue of the practice. I know, because it was you saying the words. “What would you do if someone says that words to you, Yui?” you continued. I smiled. Of course. Of course you didn’t just ask me to be yours. Of course you were just asking a hypothetical question—probably wanting my opinion since some ikemen might have just asked you out. It’s probably that actor you had always liked, wasn’t it? Or was it the guy who hosted that one TV show with you? I watched closely for any change in your expression. I watched for any tick in your gesture. How would you react to my revelation? I thought there was a hint of jealousy in your question. But, perhaps, it was just my wishful thinking. Or perhaps, you were actually jealous—because someone confessed to me first before someone did the same to you, and I didn’t tell you anything about it before. “It’s a S-E-C-R-E-T!” I tried to play it out. “Yes. Just like that. What did you expect?” I kept the smile on my lips. I pushed away from the stage. “It’s such a waste actually. He really was an ideal man,” I said. “Eee? Was he an ikemen? Come on, Yui, you should tell me more! I’m curious!” you moved from the stage to catch up with me. You were still muttering your protest. I just laughed at your annoyed expression and guided you to the dressing room with my arms around yours. The truth was: I didn’t really want to talk about this with you. I didn’t want to tell you my story just to hear you telling yours afterwards. I didn’t want to know who that guy was—the one that was asking you out. I didn’t want to hear anything about anyone who had a better chance to get your heart—even with the love ban—simply because he was born as a he and I wasn’t. Yes. I did turn that person down. I said that I love this idol group. I wanted to grow along with it. I wanted to be one of the people who take it to a whole new era. In order to do so, I need to strictly observe the love ban rule. But, the truth was, even though all of those were also true, the real reason was because I am always in love with you. You’re still here and I’ll still be able to be one of your closest friends as long as I’m still here as well. If one day you finally meet your tall ikemen, fall in love, and graduate, I wonder how I will be. I did say that I’ll probably stay around longer than you. I promised myself to send you off with a smile on my face, just in case it will be the last time we see each other. But, then, when the time comes, when you’re already been married and I have decided to leave this group to the next generation, what will I do when someone ask me that question again? I like your story! I was confused whose pov it was at first though haha. Can't wait to read more from you! OMG so ssad... but.. maybe we need the other POv.. what if she feel the same!! There are times when I was really tempted to say those words. At least, just to test how it would taste on my tongue—or so I tried to convince myself. But, no. Each time I had it on the tip of my tongue, I stopped. It felt wrong. We’re both women after all. It would be weird for me to say that to you. Wouldn’t it? But, it didn’t stop me from wondering about what answer you would give if only I had the courage to ask. Would you say no? Would you be freaked out by it? Would our friendship turned awkward? Would you stop having meals with me when it’s just the two of us? Or… Is it possible for you to say yes? After all, you did say that you love me, right? I had read it numerous times—on your Google+ posts, your tweets, every interview you had which had questions about me… You even said it to my face a few times. So, it is okay for me to think that you really do love me in that way, right? In the same way that I love you? Didn’t you also say that to Sayanee? And Mariyagi? And Iwata Karen? And Tano Yuka? And a bunch others? I think you had said it to most of the younger girls and some sempai you ever worked with in a team. Well, I guess it can’t be help. You are the soukantoku after all. You need to look after and get along with all of us. But, many times, I did wonder how you could say it so easily. How could you say you love somebody as if it was nothing? As if it was not embarrassing at all? And why is it so hard for me to say it? Why is it so hard for me to express whatever it is I feel inside? Even when some fans came up to me during the handshake events, asking about us, I could only say that, “I think it’s Yui who loves me, though.” Those fans… They called me a “ponkotsundere” when I gave that answer. You know, Yui. I know we believe that we know each other best. We know each other really well to the point that sometimes we didn’t even need to say a thing to be understood by the other. I still believe that it’s true. But, in this matter, I don’t think we know what each other think or feel at all. So, when you were quiet and deep in your thoughts, I kept asking myself: should I tell you what I have in mind? I bit my bottom lip right after I finally had the courage to voice that question. It’s actually more like a slip of the tongue than courage. We were just done with practice, exhausted, and were sitting on the edge of the stage, waiting for our turns to use the dressing room. I was just rolling the question around in my head without really meaning to say it out loud. So, when you suddenly turned your head towards me, I tried all I could to normalize the situation. “What would you do if someone says that words to you, Yui?” was my way to save myself. You smiled that smile that I always like. There were a few seconds of silence—as if you were contemplating on your answer. When it came, it was nothing like I ever imagined it would be. I needed a second to process that answer in my mind. Somehow, I felt like I couldn’t comprehend it at all. In hindsight, I was probably too shocked to comprehend anything you said. “Eeeeeee? Really?? ?” was the only response I could give to you. I was genuinely curious… and jealous. Was it jealousy in my voice? If it really was, I hope it went unnoticed. “It’s a S-E-C-R-E-T!” you said in a playful tone. I tried to press you for more information. But, you just smiled. What should I do if you said yes? What would I be able to do? Was that a relief that I felt? You kept the smile on your lips. Then, you pushed away from the stage and started walking away. “It’s such a waste actually. He really was an ideal man,” You added. Some invisible hand was gripping my heart. I felt as if my asthma was coming back. I moved from the stage to catch up with you, trying to fish more explanation out. You linked your arms with mine and guided me to the dressing room. Not knowing, nor noticing, how I regretted voicing those questions to you. How bad I felt after hearing all that. But, I know it wasn’t your fault. I had never been able to convey my feelings properly anyway. But, that didn’t stop me from hoping that you could really read my mind right then and there. If that’s even possible, I wouldn’t have to say anything and you would just let me know what your answer would be if it was me who asked you that question last summer. Won’t you tell me, Yui? I want to know. Awwwwwwwww this hurts maaaaaaaaaaaaannnn seriously. Seeing two people who love each other but don't have the courage to be truthful to their own feelings is sooooo painful. I like this sorta monologue way of storytelling! these two are an idiot! cute but idiots, I love it.. Of course I want htem together so maybe a part 3? if the first one was "the question" and the second was "the aswer" how about the last would be "the conclusion?" Sorry that it took me a while to reply. Glad to know that you like the second one as well. I am actually not really into story where the character's relationship is already established. I tend to like the story about how two people feel attracted to each other and slowly making progress toward their relationship. "Slowly" is the keyword here, lol. So, I think I won't write the conclusion part... Or at least not yet. I really like the story it was so much like what I've been wanting to read. But, then, I still want to write about it as well. So, here it is, my version of the thing. I was kind of spacing out. It was really late after all. The only reason I was still trying hard to stay awake was because we were in charge for the night’s All Night Nippon radio show with Ricchan. Well, it really wasn’t my fault if I spaced out. I tried so hard to keep my thoughts away from that concert we did last week. But, here you are, talking about it so passionately with Ricchan. “I have something, but it’s not interesting at all…,” I tried to make you lose your interest. Ah… You really didn’t make it easy for me. I guess there was no way out of that. So, I decided to talk about the only thing that was on my mind since you both started talking about the topic. “You know, Yui and I did a unit together…,” I drifted away, still trying to make it seemed like I wasn’t interested in talking about it at all. Romantic? Nerve-wrecking? Too close to what I am feeling even until now? I struggled to find the right words to describe it. Ah, I should have just trusted you with the explanation. Forbidden? Was that the only word you could come up with? Well, I guess that was the best word to choose after all. It was also a part of the song title. Yes. After all, forbidden may be the right words to describe my feelings for you. Even if the whole world changes their minds, it will still be forbidden. After all, you don’t love me, do you? But, still, it didn’t stop me from hoping that you would choose another word. Giving me more hints about how you felt about our performance together. Giving me more hints about how you felt about me… Even if it’s only about what you felt during that short time on Tokyo Dome stage. There was a sudden pain in my heart when I heard you saying that. “Really? Thank you?” you were practically beaming after hearing Ricchan’s opinion. “Huh? Really? During such a serious song?” you really didn’t know. “Yep,” I gave you my affirmation. “But, that wasn’t captured by the camera,” Ricchan commented and you nodded at her comment. Of course it was not. It was an ironic laugh after all. Hearing you saying those words with a flat expression reminded me about how ironic the situation was. There I was, wanting you with all my heart, but had to act like I was not. Then, there you were, not having any of the feelings I had, but had to try so hard like you really meant every single word you said. I made sure to move my face and the microphone away when I could not stifle the laughter any longer. If it was captured by the camera, the fans would go crazy, talking and speculating about the reason behind it for centuries. Over time, people may forget. But, the internet will never do. It will be stored for an eternity in one corner of the cyber universe until one person stumbles upon it again and re-share it with the rest of the world. Being an idol after the invention of the internet and social media sure is hard. Great. I was just letting my mind wandered a bit, thinking that the topic had gradually changed into something else, when all of the sudden, Ricchan came up with that idea. Even without hundreds of thousands of people watching, it will always be hard for me saying those words again to you. “I forgot them,” I lied. “But, I wanted to see it live!” Ricchan whined. Ricchan should really just wait for the blue ray disc to be out. For a moment, I thought you were talking to me. I wasn’t paying attention. I was just about to repeat my answer, saying that I forgot or that I didn’t want to. But, then, I realized that you were talking to Ricchan. Ricchan response didn’t make me laugh like usual. Nor that it soothed the pain in my heart. So, that really was the case, wasn’t it? When I read some fans’ comments about your expression and mine during the song performance, I thought that they were wrong. I was sure that the pained expression you had at that time was not because you didn’t want to sing the song. It was just because you were trying to show the right expression, suitable for the sad lyrics. But, your comments on tonight’s ANN showed that it was me who was wrong. You really didn’t want to sing the song. No. If I remember it correctly, you just said that you didn’t want to sing the song with me. I try to look at you, guessing what your answer will be if I voice that curiosity. But, you are just standing there, right next to me, in silence. We are at the main gate, waiting for the management’s driver to come and pick us up so we can go home. Ricchan had left earlier. “Un? What’s wrong?” you turn your head and ask me. You nodded. So, I initiate one of the few physical contacts I allow myself to do with you. I put my left arm around your shoulders, hugging you a little. Then, I move my left hand up and down on your arms, trying to make you feel a bit warmer. The car arrives and we quickly get in, sitting next to each other at the back seat. It will take quite some time until we arrive at your home and then my apartment. So, I look outside the window, drowning myself in my own thoughts. You don’t say anything in response and just close your eyes. So, I go back to let my mind wander while staring at the reflection of myself and the street lights on the car window. Both the Manatsu No Dome Concert and the radio show are over. I shouldn’t dwell in everything that has happened. If you really don’t want to sing such song with me, I should just make sure not to accept any romantic duet with you in the future. Yes. After all, we can’t change other people or the past. But, we can always change ourselves and the future. “Ne, Yui,” you suddenly say. “Un? You don’t have to apologize just because you’re not sleeping when I thought you were,” I laugh. You catch me off guard. Right after I decided to just let everything about it go, you drag me back to that exact topic. I can’t help but wonder whether you’ve been thinking about it this whole time as well. “No need to say sorry if that’s really what you felt, Paru,” I try to give you another smile. I really do love you after all. During the whole performance, I tried to keep a straight face and didn’t look at you—unless if it really was inevitable—to make sure that no one got any hints of my feelings for you. I guess it really did work since the fans’ comments online stated that I was really expressionless during the whole performance. We stay silent for the rest of the journey to your home. So, I let myself drowned in my own thoughts again. When the car finally stop and you gather all you things, ready to step out of the car, I grab a hold on your hand. You stop and look at me with a question in your eyes. I pause for a second, deciding on what to tell you. You look stunned for a moment. It’s as if the words don’t really register in your brain. But, then you smile widely, causing the dimples formed on your cheeks. I am really a coward, aren’t I? I was actually going to say something else to you just now. I was actually thinking of just letting you know about my feelings—hoping you would understand why I said what I said, how all those talk about our duet made me feel… Even if you don’t accept my feelings, it’s all right. I just hope that you’ll be able to understand… But, then I backed out. Deciding to say it in a rush may not be a good thing—or so my cowardice self convinced me. thank you for this fic! Always glad to see more Yuiparu fics. Awwww maaaaaaan, this reminds me of YuiParu's original song "Tomodachi de irareru nara", sooo befitting theme song for your fics. You're all too kind. I keep torturing you with all this angst-unrequited theme, yet you are still happy to read it. Lol. Thank you. @Haruko: Thanks for reading it! @Yuki88: Should I make a "Tomodachi de Irareru Nara" songfic next then? Veeery nice! The three of them! The thing that makes them more interesting and good is that you stick to a truest reality in which that might happen! I love how an author writes with the intention of make it feel more real. Thank you! @TotyTRC: Glad you like it. I didn't really intend to stick with reality (I also like lots of AU fics ), but it does seem more entertaining if it feels real, right? @Yuki88: I did try to write a Tomodachi de Irareru Nara inspired fic over the long weekend. But, it turned out to be quite long (longer than the previous ones) and, somehow, I'm not satisfied with the way it ended. Yet, I don't have the time to revise it now. I may not be able to get online for this until next week or so either. So, I decided to break it (inequally) into two-parts and save the second part for later when I have time to re-read and revise it. Here is the first part. Like before, I guess it can be read as a stand-alone OS, yet it can also be considered as the continuation of previous ones. The time setting is this year, 2016, after Nagao Mariya's graduation and Koi Kojo drama announcement. I'm still torn between letting Yuihan and Paruru kiss in the end (which will also mean that I will move on with a completely new, AU, YuiParu fics afterwards) or not (then continue with related fic afterward). So, if you don't mind, Friends, please read this first part and let me know how you think it should end. Thank you. How long had it been since the last time all of us went out and had a meal together? It hadn’t been that long, had it? After all, we ate together quite frequently. There is a reason why people said that we, 9th generation members, are really close with each other. But, why did I feel like I hadn’t seen you forever? “You’ve been spacing out for a while. It’s not something you usually do when we eat together,” she said. “Yes. You’re usually eating so fast, especially when we’re having grilled meat. We literally need to race with you to get a piece. But, that doesn’t happen today. What’s wrong?” Mariko chimed in. “Hahaha… Guess I’m just a bit tired,” I tried to reason. I tried to explain that that was not the case. Everyone had been really nice and helpful all this long. So, she didn’t need to be worried. But, even after that long explanation, I could still see you giving me a concerned look from the other end of the long table. Ah, how I wanted to sit across or next to you like we usually did. Too bad, you arrived late today. Mariyagi and Haruu had taken all the places I usually reserved for you. It’s actually you who had been working hard lately, wasn’t it? You’re so busy with that drama shooting and still had to show up for all the practice sessions, stage performances, and media appearances. Yes. Maybe that was why I felt like I hadn’t seen you forever. I missed you. “Aah…that was really delicious wasn’t it?” Haruu said while smiling widely. “It really was,” Minarun agreed. 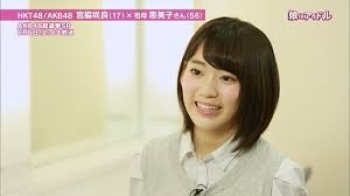 “I was a bit worried that Yuihan ate so little. But, now I am also worried since you two ate too much. Didn’t you say that you both are on diet?” Mariko asked. “Now, now, Mariko, don’t ruin their happiness,” Miyu laughed. I smiled at the playful banter. As much as I like hanging out with other members, I always enjoy spending time with 9th gen the most. I looked at your way, expecting you to laugh along or add some salty comments to the conversation. But, there you were, checking your phone, squinting. I really wanted to say something along that lines as well. But, I knew that you couldn’t help it. It’s not your fault if you’re so busy. You started to go around the table, giving hugs to the ones you couldn’t easily see anymore and a wave to the others. With Ranran and Minarun in SKE, then Mariyagi’s graduation, it’s even harder for us to arrange some time to get everyone together. I wondered when we would be able to get together like that again. “Make sure to get enough rest, okay?” you whispered next to my ear. I really didn’t want the hug to end. But, I knew that you had to go. So, I held myself back, trying to be satisfied with what little I could get. “You, too,” was my reply while touching your arms, giving them a light squeeze. You left right after that, leaving the rest of us thinking about what to do next. We planned to go to a karaoke place or go shopping. But, everyone were so full and it didn’t seem that fun anymore since you’re not there—or perhaps it was just me who felt that way. In the end, we decided to take a bit of a walk around the shopping district and take a picture at the purikura booth. We took turns so we could get the picture taken properly. We laughed at the results, seeing how the special effects made our eyes appeared bigger. Then, for the last picture, we decided to squeeze ourselves in the booth so we could take at least one picture together. Too bad, you weren’t there. I really wanted to take another picture with you. We said our goodbyes afterwards. I walked with Mariyagi and Miyu for a while until we went our separate ways. It was one of those rare days where I had the whole day and night off. I thought about going home and just spending the rest of my free time with Bisu. The cat was probably sleeping on my bed at that moment. However, when I waited for the train, I decided to take an impromptu detour. I put my mask and earphone on. Then, I set my playlist on shuffle and wandered around in Shibuya absent-mindedly. Not long after that, the song we recorded more than a year ago was on. Tomodachi de Irareru Nara. I smiled to myself and put the song on repeat. It was suddenly like that day again. The day when I wandered around in Shibuya with low battery because I played the demo version of the song over and over again. Someone said that people tend to like something that she or he can relate to. Perhaps, that’s why I like the song so much. Fans acceptance to our YuiParu combi had been great since a couple years ago. So, I thought, Sensei might write the song as a fan service or because the market was promising. However, sometimes, I couldn’t help but wonder whether he could see right through me, see through my feelings for you, and wrote the song accordingly. I didn’t know how long I had been wandering around when I heard your voice. At first, I thought that it was just my imagination—something that occurred because I missed you too much. But, then, I turned to where I thought the voice was coming from, and there you were. “Ah, Paru,” I took my mask and one of my earphone off. “Thinking about buying a new dress?” you smiled and walked closer. I realized that I had been standing in front of the same shop for a while. It might seem like I had been looking at the dresses on display for quite some time. But, I was actually just standing there absent-mindedly, listening to the song, drowning myself in my random thoughts. You stood right next to me, looking at the same display. “Yes. It was an interview for the drama I am starring,” you answered. I didn’t realize that it’s been that long. Looking around, I just realized that it was quite late at night. “And you’ve been wandering around alone for three hours?” you gave me that concerned look again. There was a few seconds of silence after that. We were just standing there, in front of the display, without really looking at it. The song was still playing on my right ear. “Ne, Yui,” you said after a while. “Want to hang out with me?” you asked without looking my way. I was dumbstruck. As if on cue, that particular verse was playing on my right ear. I took the earphone off. I didn’t want the song to make me read too much into your words. Yes. I wanted to be with you for a little more. Yes. You may want to spend some more time with me. But, the reason behind it may be different than mine. Did I say maybe? No. It must be. “Ah… You’re right,” you looked at your phone and seemed disappointed. That face. I would never be able to let you down if you show me that face, would I? “Why don’t we…,” I started to say. You raised your head and turned it to me, looking hopeful. You gave me an immediate, “Yes.” I chuckled at your happy face. Out of habit, I put my left arm around your back and guided you towards the train station while we talked about random things. I didn’t realize what I was doing until we got on the train. As I grabbed the hand rail with my right hand, I decided to remove my left arm from your back. But, right at that moment, you decided to hold onto it to steady yourself. There wasn’t any vacant seat, but the train was not that crowded. Yet, you decided to hold onto me until we reached our stop, ignoring the available hand rails. Was it wrong for me to feel happy because of that? I knew that you might not mean anything by that. But, still, it made my heart fluttered. “Ojamashimasu,” you said as you entered my apartment. I locked the door behind you while you took your shoes off and proceed to go further in. “Onee-san is not here?” you asked, referring to my sister. You just nodded at my reply while putting your bag on the table. You were about to sit on the couch when Bisu walked out of my room and strolled to the living room. Your face lighted up instantly. I smiled as you went to pet Bisu, trying to get him to play with you. It really did feel like a long time since the last time I saw you with him. When was that last time, I wonder? “What are you doing just standing there?” you asked while lifting Bisu up and took him to sit on the couch with you. “Nothing,” I smiled and shook my head. We spent some more time to chat randomly. Then we took turns to take a shower and changed into our pijamas. After Bisu was well fed and rested on his bed, we moved to my room. There were some movies that I had bought but hadn’t got any chance to watch. So, I let you pick one and put it on, then turned the lights off. We watched the movie while sitting on the futon, leaning on the side of my bed. “Ne, Yui,” you said, a few minutes into the movie. I looked at your face, trying to see why you were asking me that question. You seemed a bit troubled, but you didn’t look at me. The possibility of a kissing scene was actually something I dreaded the most about the new drama series. So, I tried not to think about it. But, now that you had asked, I couldn’t help but doing so. You just nodded. Your silence made me couldn’t help but wonder. “Will there be one in yours?” I decided to voice my curiosity. “I don’t know yet…,” you answered. You thought about it for a second before you nodded. You shot me a death glare when I laughed. The truth was, I didn’t feel comfortable talking about it. Thinking about you kissing someone, even though I knew it was just for a drama, made me feel uncomfortable. So, I tried to joke about it to hide my discomfort. But, it was clear that you were also feeling uncomfortable thinking about it. It’s probably something you had been thinking about since the project was announced. So, I put my arm around your shoulders and gave you a little hug. Yes. It would still be awkward, especially if the director asked for a re-take. There would also be chances that your lips would brush the other person’s lips or something like that. But, at least, thinking that it would not be a real kiss helped calming me down a bit. I was taken aback by your question, but I tried not to let it showed. I took a few seconds to think about it. Had I ever kissed or been kissed? You didn’t say anything in response. If it’s any other member, I might return the question back. But, it’s you and I didn’t want to hear your answer. I didn’t want to give myself a shock if you answer it with a yes. However, I guess, your next words did give me a shock after all. I almost spat out the water I was drinking when I heard that. Another fun YuiParu read. I really like this AU, so I'm almost hoping for the kiss to be delayed a bit to get more YuiParu fluff if possible. If I were drinking when I was reading this, I would've spat my drink at the same time as Yuihan lol. Knowing YuiParu, it's possible Paruru would just go for it if she really means it lol.